Only Admin users will be able to setup Routing modes. This is the default routing mode setting when you sign up for a HappyFox Chat account. (Mighty to Enterprise plans). The incoming chat notification will be displayed to all the available agents. An agent will be able to handle unlimited chat requests. The incoming chat request will be auto-assigned to a particular agent based on LOAD (no of chats he/she is attending). If all the agents are carrying the same load then chat will be assigned to a random agent. 1. 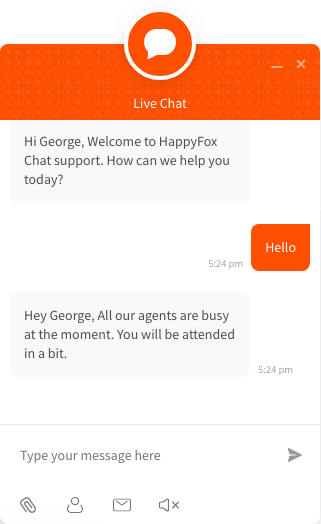 Login to HappyFox Chat account with Admin's credentials. 2. Go to Manage page and click on Routing from the sidebar. 3. Choose the desired routing mode. Click on either of the radio button. 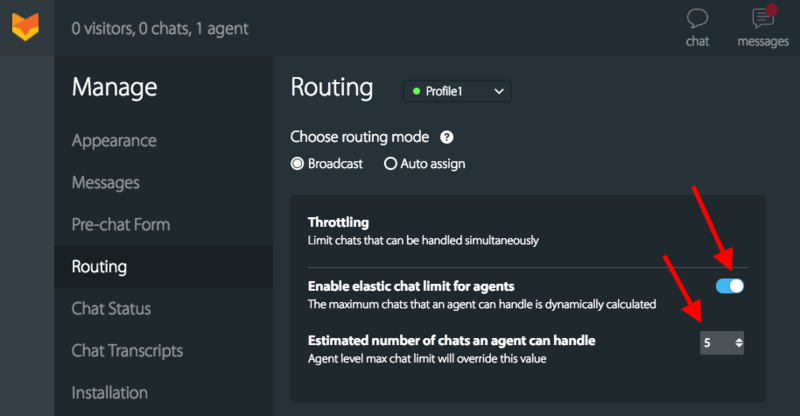 If you want to set profile level maximum chat limit for an agent, you can turn ON throttling toggle and provide the no of chats an agent can handle in the text box provided. Once your agents are in their maximum chat limit, Offline form will be displayed to your visitors. They can send offline messages. In profile level max chat limit, the no of chats an agent can handle is dynamically calculated i.e. if there are 2 profiles and if the max chat limit is set as 5 in each of the profile, an agent can handle up to a maximum of 10 chats. So the agent becomes busy (attains max chat limit) when he accepts 10 chats. 1. To setup, In admin's login, go to Agents page. 2. Click on a particular agent tile and set the max chat limit. 3. You can also unset the max chat limit here. Note : This individual agent level max chat limit will supercede the profile level max chat limit count (if set). When all the agents are in their max chat limits (BUSY), a waiting message also known as queue message will be displayed in the chat window. Your visitors will be added to queue automatically. 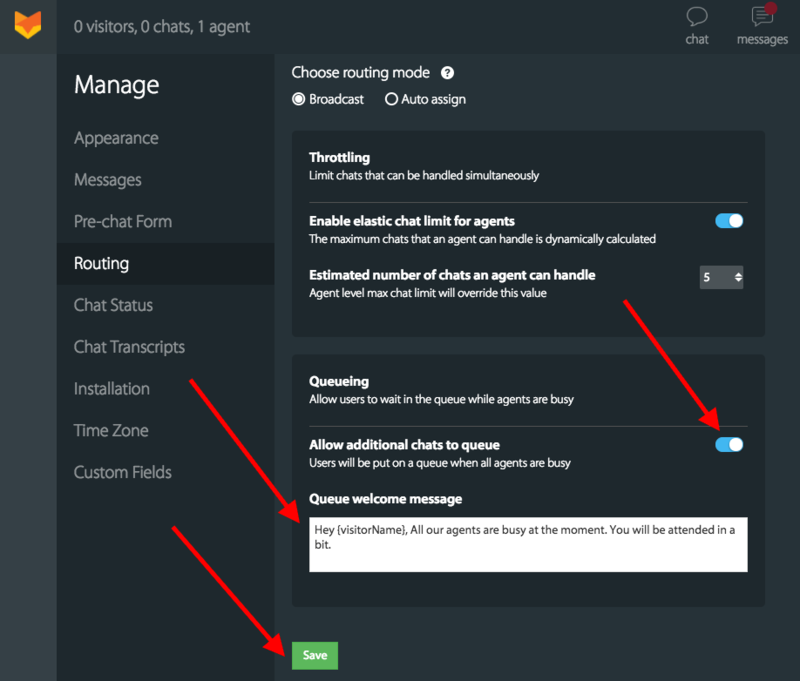 When the agent is free from his/her max chat limit, the chats will be automatically released from queue one by one and will be available for the agent to accept them. Don't you worry! 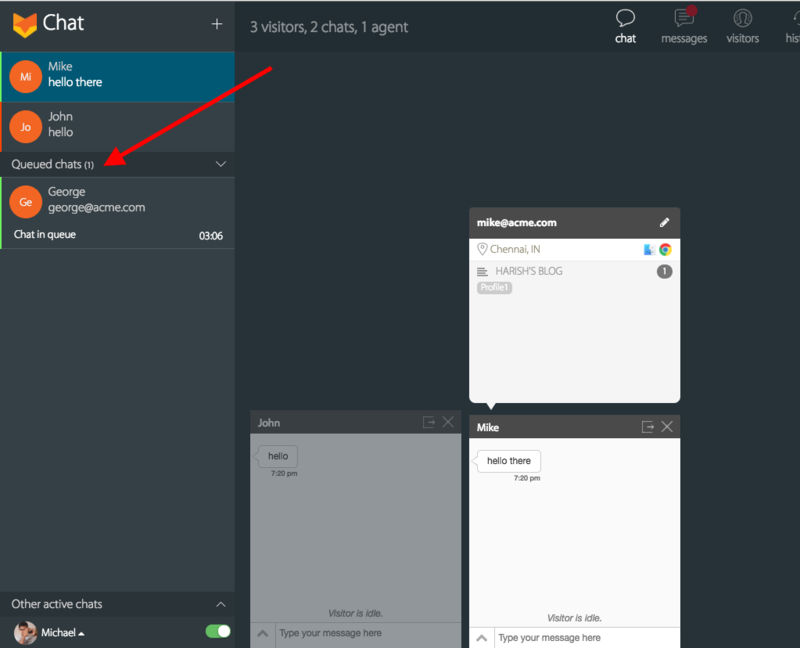 you can instruct the app to automatically re-assign the unaccepted chat to the other available agent so that you don't miss your visitor. 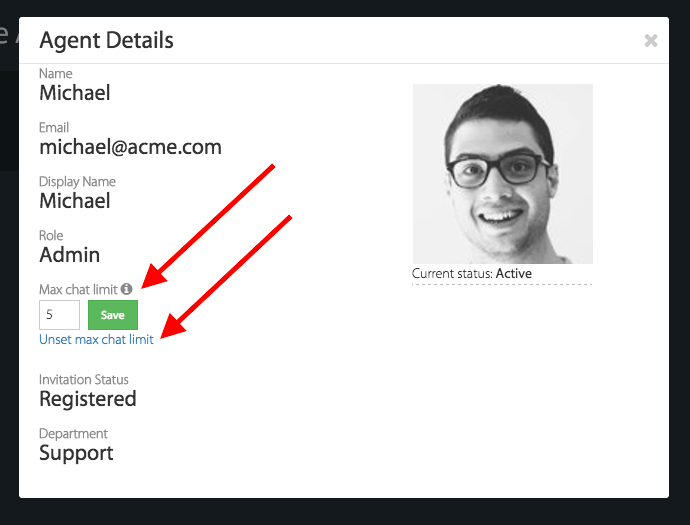 This is available when you have chosen Auto-assign as your mode of Routing chats. 2. Set the time limit for re-assignment of chats. (in seconds.) and save the page.